Protect the team from rain and wind while they take a breather from the game under this impact resistant Elite Team Shelter II. Smoke colored Lexan polycarbonate panels provide shade and protection from the sun, and the curved frame gives this shelter a modern look. 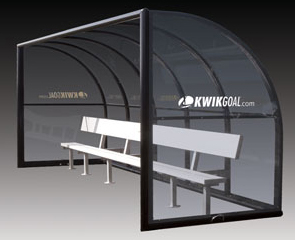 15' aluminum bench with back is included to provide ample room for the whole team. Store plenty of equipment and gear underneath or behind the bench, keep it protected from the elements. Equipment must be anchored at all times (aside from transport). Not recommended for use during periods of high wind activity. Dual purpose shelter lift/wheel dolly kit features powder-coated all steel construction with brackets for wheel storage. Kit includes steel dolly with wheels and four swivel wheels with flat proof tires.